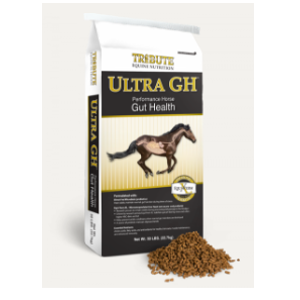 A pelleted feed formulated to optimize digestive health in mature horses at maintenance or in training. Contains direct-fed microbials. Formulated with Tribute's TRIPLE THREAT Gut Health Approach: Equi-Ferm XL, specific organic performance minerals, and a fermented soya. Direct-fed microbials - viable and heat-stable microbial feed additives available to maintain normal gut function during times of stress. Higher fat, highly digestible fiber for healthy, sustainable energy.